French liturgical poet and, possibly, Biblical commentator of the end of the eleventh century. Meïr and his son Eleazar are quoted in the commentary to I Chron. (xxix. 11) wrongly ascribed to Rashi. He composed several piyyuṭim, the best known of which are "Torah ha-Temimah" (a supplication interspersed with many Aramaic and Talmudic words and having the general rime in , and in which he expresses his horror of apostasy) and "Almanot Ḥayyot," a seliḥah for Yom Kippur. Both piyyuṭim are signed and are acrostics containing the name "Eleazar." The second piyyuṭ was translated into German by Zunz ("S. P." p. 184). 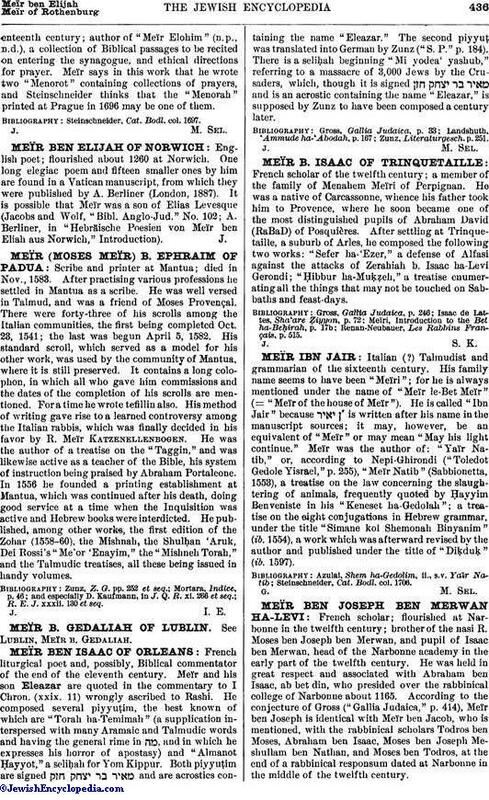 There is a seliḥah beginning "Mi yodea' yashub," referring to a massacre of 3,000 Jews by the Crusaders, which, though it is signed and is an acrostic containing the name "Eleazar," is supposed by Zunz to have been composed a century later.